* Will collect 50% advance commission and pass contact after received payment. Fully refund is promised if the job is unsuccessful or after first class. * Share this post or private message/call me (Belinda) at 018 2540 128 OR WhatsApp if you have any friends interested. 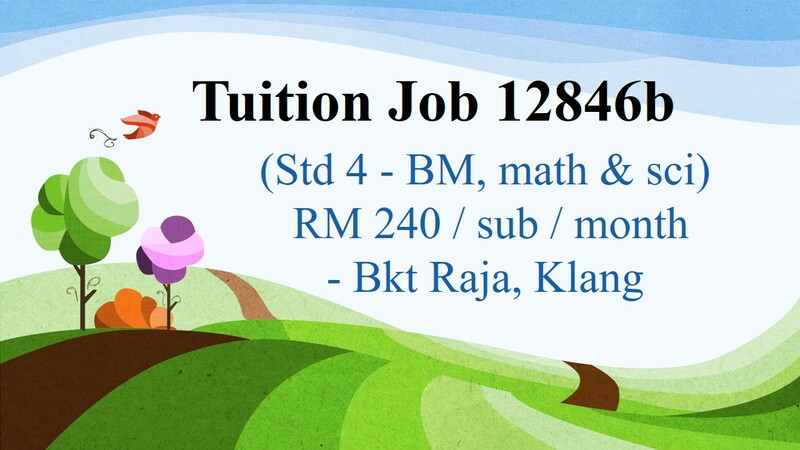 * Registered tutor can apply by Whatsapp (12846b, Full name, Time slot, Subject, Year of exp). * Only shortlisted candidate will be notified tq. A) Please make sure to register yourself FREE at http://perfecthometuition.com/register-as-tutor/ before applying the job for FIRST time tutor and mention the job number. We need to send your profile to parents/student. 1) Your full name, tuition case No., Subject. 2) Years of experience in teaching the subjects, and your available slot for tuition. 3) Eg: (“FULL NAME”, “Case No”, “subject” , 3 years experience, Saturday 12pm – 1.30pm). D) Only suitable candidate will be contacted. 50% commission first FULL 4 weeks. Priority given to tutor who can pay upfront. We know your are busy to check back for new jobs, just enter your email below to get latest tuition jobs straight from your mailbox. We don't spam and we promise your information will NOT be shared with others. Join 3,033 other subscribers now! Stay up-to-date with latest tuition jobs! Like our page for exclusive content and updates! Follow us for exclusive content and updates! Copyright © CNT Perfect Solutions (002148439-X). All rights reserved.